These guys love to socialize. Bringing one of these feathery friends home is a lifetime commitment—your lifetime—so be prepared. 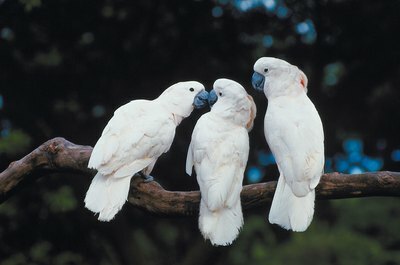 Your cockatoo can outlive most other household pets as long as he is in a happy, healthy and loving home. If you were planning on a short visit from one of these guys, think again. Cockatoos have an average life span of 50 to 70 years. This is if they have led a healthy and safe lifestyle, of course. Yes, that means no playdates with the cat or late-night cocktails. A healthy lifestyle is a must if this little guy wants to grow into his golden years. A high-quality bird food is important, as is including fruits and veggies into his diet. Keep his water clean, allow him socialization time every day and visit the vet as soon as you suspect something could be ailing him. Even with your best efforts, sometimes illness and accidents happen. If you are not your bird's first caretaker, he may not have had the best care from the beginning. A poor-quality bird food mix, for example, may have robbed your birdie of necessary nutrients for a while. And some foods that are harmless to humans can harm or even kill a cockatoo. To keep him around as long as you can, make sure never to give him chocolate, onions, dried beans, apple seeds, mushrooms, avocado, tomato leaves, high levels of salt or alcohol. You also want to avoid giving him carbonated beverages, fruit seeds and pits, raw peanuts, olives, asparagus or rhubarb, as they can cause illness. There will be decades of companionship with this guy, so you should make the best of it. Buy him a big cage so he can move around easily. He will appreciate the love and attention you give him, so do this regularly. Give him time to socialize with other feathered friends as well. If he feels lonely or isolated, not only will he become unhappy, he may even resort to self-mutilation. Are Rat Terriers Prone to Aggression?